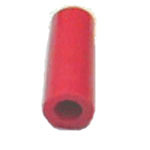 Red rubber post sleeve used on some modern Stern Pinball games. Rigid rubber, tapered from top to bottom (thicker at top, thinner at bottom). Measures 1/4-inch ID 7/16-inch OD 1-1/16-inch tall. STERN: Ripley's Believe it or Not!